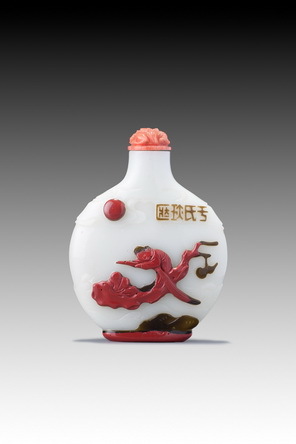 This bottle is an important key in identifying bottles commissioned by Yu Changsui, who lived in Yangzhou 1861 – 1883. 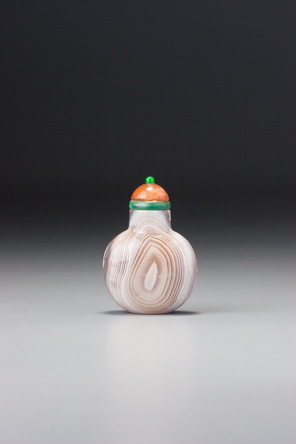 See Sale 3, lot 122. The output from Yangzhou in the late nineteenth century is spectacular, with many displaying carving in the ground colour, as here, where the clouds around the shoulders and the formalized water round the base are both carved in the ground colour and, indeed, as a relief plane between the ground plane and the first layer of cameo-overlay. This typical example also has a surface layer of cinnabar red. This is the most common upper layer on multiple overlays from the school which, if it appears as other than the surface layer, is often the middle one. Very few multiple overlays attributable to the Yangzhou school are without this colour in one of the two uppers layers. See Sale 3, lot 122, and Sale 4, lots 44, 90, and 115. All have cinnabar-red as the surface layer. Impressive though the carving style may be and spectacular though the multiple-overlay bottles invariably are, the detailing of the footrim is nearly always of modest nineteenth-century standard. They also exhibit careless matching of the overlay colour to the form, which in the case of so many of this group is far removed from their imperial, mid- to early-Qianlong counterparts. Neat, sharp-edged, crisply carved footrims similarly give way here to irregularly rounded ones lacking formal integrity. Were this not typical of these multiple overlays, one might reasonably assume the rounded edges to have resulted from the removal of chips. The figure in the log boat may be intended as Zhang Qian (see Sale 2, lot 151) or Magu (see Sale 5, lot 138).